Botryomycosis, also called as bacterial pseudomycosis is a chronic, granulomatous, suppurative infection caused by Staphylococcus aureus. Other bacterial species such as Pseudomonas aeruginosa, Proteus mirabilis species, and Escherichia More Details coli have also been isolated from the lesions. These organisms form granules which are composed of bacterial masses which are adhered together. Skin is the most frequently affected site, aponeuroses, bones, tendons, and muscles can also be affected. The disease can also manifest with the involvement of visceral organs only. The present report highlights clinical manifestations of a rare case of cutaneous botryomycosis involving the orofacial region. A male patient aged 37 years old, a rice mill worker by occupation reported to the outpatient department with the chief complaint of swelling and pus discharge from the left side of the cheek for 3 months. The patient gave a history of trauma to the same site 4 years back by road traffic accident. On eliciting the history, he was apparently normal after trauma for 1 year and he noticed pus discharge and pain on the left side of the face 3 years back, following which he visited a private dental hospital and underwent surgical debridement. The patient was asymptomatic following the treatment for 2½ years. He had experienced similar symptoms 6 months ago for which he was treated again at the same institution and was given antibiotics. The patient again developed swelling in the same region with pain and pus discharge for 3 months. He did not experience any reduction in the symptoms following 15 days of tetracycline therapy and visited our hospital for further evaluation. The patient's medical history, drug allergy, and family history were noncontributory. Extraoral examination revealed facial asymmetry with diffuse swelling on the left side of the face measuring around 4 cm × 5 cm in size; lesion was extending from the left commissure of the mouth till the ramus of the mandible. The swelling had multiple draining sinuses with a yellowish exudate [Figure 1]a and [Figure 1]b. No paresthesia was elicited. Intraoral examination revealed an ill-defined swelling extending from the distal aspect of 35 to the distal aspect of 38, with obliteration of the buccal vestibule, with multiple sinus tracts. No pus discharge was noticed [Figure 1]c. Considering the history and the clinical findings, a provisional diagnosis of chronic granulomatous infection of the left orofacial region was given. A differential diagnosis of actinomycosis, botryomycosis, fungal infection, and tuberculosis was considered. 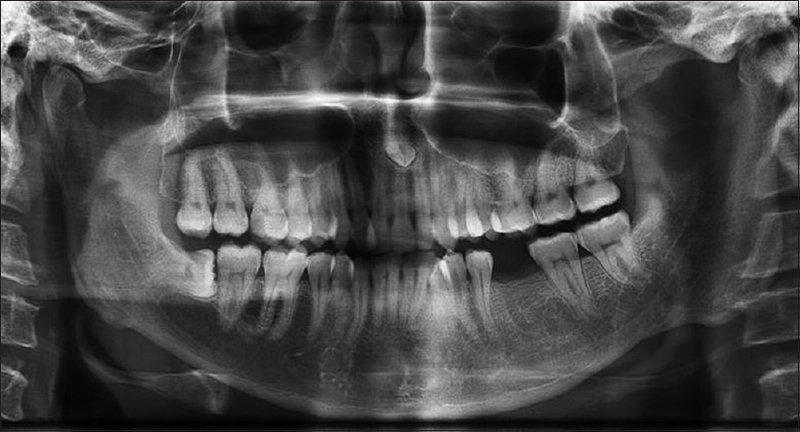 Panoramic radiograph showed no abnormalities in the region of interest. A radiopacity resembling, a tooth-like structure was seen in the periapical region of the maxillary left central incisor, suggestive of an impacted supernumerary tooth. Horizontally impacted lower right third molar was also noticed, and the lower left first molar was missing [Figure 2]. The patient was referred for the evaluation of immunocompromised status, and the results were negative. An incisional biopsy was done, one from the region of the intraoral sinus tract and another from the extraoral lesion. Pus from the lesion was sent for culture and sensitivity, but the results were nonspecific. The histopathological examination revealed the presence of dense inflammatory infiltrate with neutrophils, lymphocytes, plasma cells, histiocytes, and macrophages. Furthermore, colonies of cocci surrounded by eosinophilic material were seen in a fibrillar stroma, and the Periodic acid–Schiff staining showed the presence of bright pink granular areas surrounded by dense inflammatory foci, which were suggestive of botryomycosis [Figure 3]. The patient was treated by surgical debridement followed by antibiotic therapy with azithromycin 1 g IV for 2 weeks. The patient is currently under follow-up. Botryomycosis is a chronic granulomatous infection, which was discovered 130 years ago, in horses. Otto Bollinger in 1870, first it described it in a horse lung and the term botryomycosis was coined by Sebastino Revolta in 1884. The first case affecting humans was reported by Spitz in 1903 and Opie in 1913 reported the first case of visceral involvement. As the name suggests, “botryo” means bunch of grapes and mycosis is suggestive of fungal origin. The disease was thought to have a fungal origin till 1919 when Magrou described the bacterial etiology. Small and Koebner in 1967 reported the first case of involvement of the oral cavity. It is broadly categorized into cutaneous and visceral forms. Multiple Gram-positive and negative, aerobic, and anaerobic organisms have also been isolated, including S. aureus, P. aeruginosa, P. mirabilis species, Peptostreptococcus, or mixed oral flora. Defects of cellular immunity are seen in botryomycosis, particularly with low total lymphocyte counts, mainly of T lymphocytes. The most characteristic feature of the disease is that bacteria group together to form conglomerates resembling the sulfur granules of actinomycotic infection. The common predisposing factors include trauma to the skin and immunocompromised states. The present case also has a history of trauma 1 year before the first episode of the disease. Botryomycosis occurs in all the age groups with a male predilection. It is clinically characterized by nodules, sinuses, fistulae, abscesses, and ulcers with seropurulent discharge. The present case also had similar clinical presentation. Most frequently affected regions include skin of the hands, feet, gluteal and inguinal regions, rarely affecting the face and scalp. Bony involvement can be seen in the feet, legs, skull, spine, and mandible, due to direct spread of the infection from the skin, with clinical and radiographic features resembling osteomyelitis. The visceral form frequently affects the lung, with lobar consolidation. To the best of our knowledge, out of the three cases reported from India on botryomycosis,,, this is the first case with involvement of the orofacial region which makes our case very rare. The present report highlights the clinical and histopathologic features of a rare case of botryomycosis in the orofacial region which adds valuable information to the literature. Dentists need to have thorough knowledge for the diagnosis and treatment of this infrequent entity in their practice. Future studies are required for the effective management of this rare condition. The authors certify that they have obtained all appropriate patient consent forms. The patient understand that name and initials will not be published and due efforts will be made to conceal identity, but anonymity cannot be guaranteed. Deshmukh S, Saxena D, Sonarkar R, Saboo R. Botryomycosis in a young male: A case report and review of literature. Int J Curr Res 2016;8:33640-3. Kinhal VA, Vishwakumar KS. 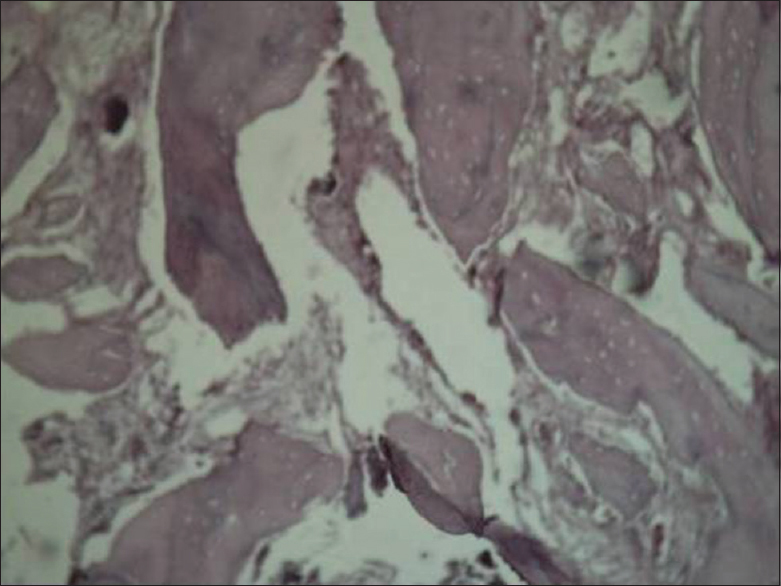 A rare case of cutaneous botryomycosis – A case report and review of literature. J Evol Med Dent Sci 2017;6:3197-8. Yencha MW, Walker CW, Karakla DW, Simko EJ. Cutaneous botryomycosis of the cervicofacial region. Head Neck 2001;23:594-8. Small IA, Kobernick S. Botryomycosis of the tongue. Report of a case. Oral Surg Oral Med Oral Pathol 1967;24:503-9. Desgarennes C, González DV, Bonifaz A. Botryomycosis. Clin Dermatol 2012;30:397-402. Devi B, Behera B, Dash M, Puhan M, Pattnaik S, Patro S, et al. Botryomycosis. Indian J Dermatol 2013;58:406. Fernandes NC, Maceira JP, Knackfuss IG, Fernandes N. Botriomicose cutânea: Relato de caso. Ann Bras Dermatol 2002;77:65-70. Razmi TM, Mahajan R, Agrawal P. Image gallery: Cutaneous botryomycosis at an unusual site in an immunocompetent patient. Br J Dermatol 2017;176:e3. Mermin D, Védie AL, Jullie ML, Fauconneau A, Beylot-Barry M, Pham-Ledard A, et al. Cutaneous granular bacteriosis occurring in Staphylococcus aureus septicaemia. Ann Dermatol Venereol 2017;144:275-8. Eyer-Silva WA, Silva GA, Ferry FR, Pinto JF. Facial botryomycosis-like pyoderma in an HIV-infected patient: Remission after initiation of darunavir and raltegravir. Rev Soc Bras Med Trop 2017;50:277-9. Cataño JC, Posada V. Disseminated cutaneous infection. Pan Afr Med J 2016;25:259. Chintaginjala A, Harshavardhan K, Kumar AS. Cutaneous botryomycosis: A rare case report. Indian J Dermatol 2016;61:126. Bashline B, Morrison M, Ramirez J, LaFond A. Disseminated botryomycosis: A rare presentation. J Drugs Dermatol 2014;13:976-8. Mechow N, Göppner D, Franke I, Kolesnik M, Bonnekoh B, Gollnick HP, et al. Cutaneous botryomycosis diagnosed long after an arm injury. J Am Acad Dermatol 2014;71:e155-6. Sreekanth R, Pallapati SC, Thomas BP. Tuberculous botryomycosis of the hand: Case report. J Hand Surg Am 2014;39:1810-2. Askari K, Seyed Saadat SN, Seyed Saadat SM, Yousefi N, Ghorbani G, Zargari O, et al. Cutaneous botryomycosis caused by Staphylococcus aureus in a patient with diabetes. Int J Dermatol 2014;53:413-5. Ishibashi M, Numata Y, Tagami H, Aiba S. Successful treatment of cutaneous botryomycosis with a combination of minocycline and topical heat therapy. Case Rep Dermatol 2012;4:114-8. Huang CF, Liaw FY, Dai NT, Ou KW, Wang CC, Wang WM, et al. Botryomycosis presenting as nasal cutaneous fistulas caused by prevotella melaninogenica. Clin Exp Dermatol 2012;37:501-4. Gosselin A, Bosdure E, Hesse S, Barlogis V, Chrestian MA, Dubus JC, et al. Neonatal botryomycosis. Arch Pediatr 2011;18:183-5. 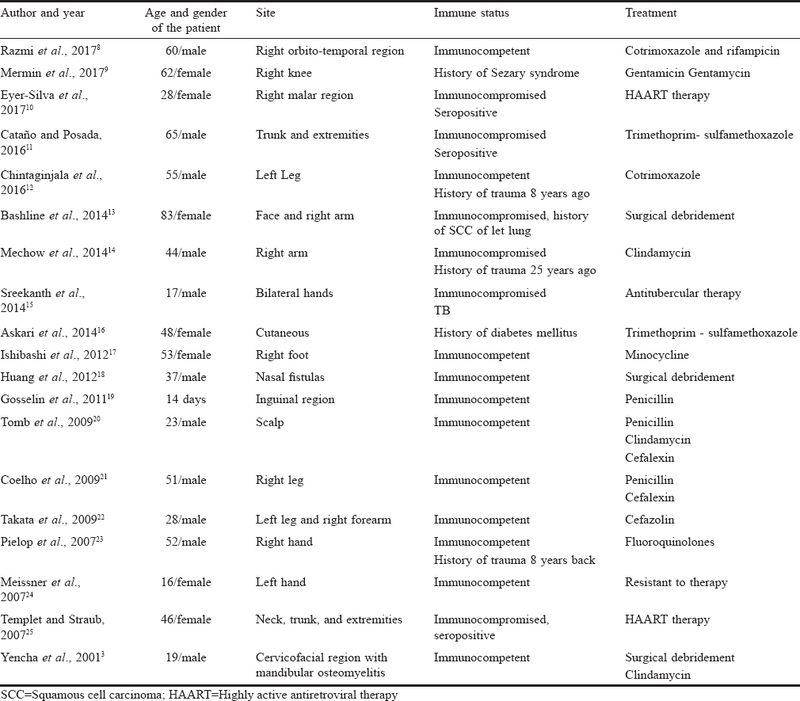 Tomb RR, Stephan F, Haddad A, Choucair J. Cutaneous granular bacteriosis, a rarely diagnosed infection of the head and the neck. Clin Exp Dermatol 2009;34:887-9. Coelho WS, Diniz LM, Souza FJ. Cutaneous botryomycosis: Case report. Ann Bras Dermatol 2009;84:396-9. Takata T, Nakajima H, Ikeda M, Kodama H, Tamaki H, Sano S, et al. Cutaneous botryomycosis associated with eosinophilic cellulitis. J Dermatol 2009;36:551-4. Pielop JA, Phillips R, Rosen T. Actinobacillus actinomycetemcomitans isolated from a case of cutaneous botryomycosis. Cutis 2007;79:293-6. Meissner M, Spieth K, Wolter M, Gille J, Boehncke WH, Thaci D, et al. Cutaneous botryomycosis. A rarely diagnosed bacterial infection of the skin. Hautarzt 2007;58:966-8. Templet JT, Straub R, Ko C. Botryomycosis presenting as pruritic papules in a human immunodeficiency virus-positive patient. Cutis 2007;80:45-7. 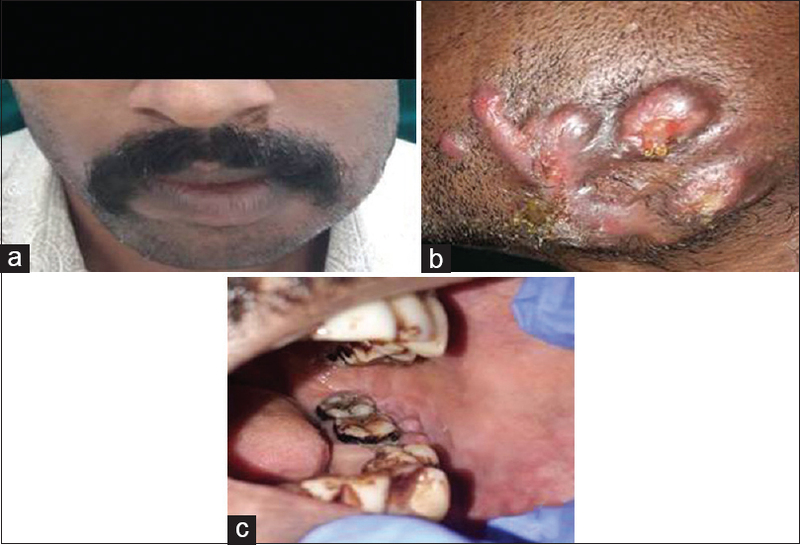 Vasishta RK, Gupta N, Kakkar N. Botryomycosis – A series of six integumentary or visceral cases from India. Ann Trop Med Parasitol 2004;98:623-9. Eswari L, Revathi TN. Botryomycosis: A case report. Int J Sci Rep 2015;1:139.